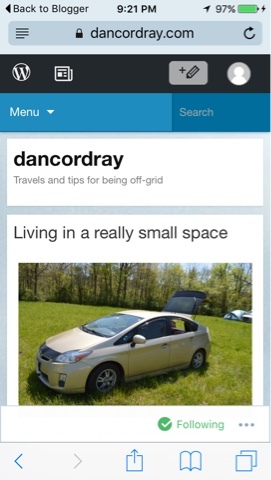 Brent's Travels: My Prius - "Living in a really small Space." I met Dan at the GTG my first day there flying his two drones. Both have cameras and can take video. Dan and I have something in common in that we were both in the fire service and we were both EMT's. I am kind of an oddity in that I'm just under 6 feet tall and I live in a Prius. Not only do I live in my Prius, I have the same general capabilities in my Prius that I had in my Class B. This being my second year living in my Prius, I have some engineering improvements this year that stand out. One is my table that doesn't have legs and stores in the same space I had least year. That's right no additional space requirements for carrying a table. I carried my back packing table too but never used it. My table design worked so well I will not bring the backpacking one next year. I also designed a better water storage system and access to my clothing. These along with some things that are less visible, my Prius living was much better. So, Dan asked I he could video my setup and I was happy to help others looking to travel in small spaces. Here is the link to Dan's blog where he posted still shots and there is a link to the YouTube video. Thanks to Dan for making this available and if anyone has questions please email me or post to this blog and I will reply.